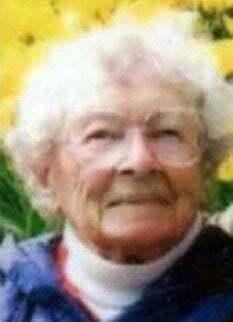 QUEENSBURY — Frances Shapiro died peacefully at Glens Falls Hospital on Nov. 21, 2018, the morning after her 105th birthday. She was born in New Jersey on Nov. 20, 1913, the daughter of Russian immigrants. Besides her parents, she was predeceased by her sister, Rose; brother, Jules; and her most beloved husband, Irv Shapiro. Upon the death of her father, Fran dropped out of school after the eighth grade and went to work to help support her family. After secretarial training, she worked many years for Union Carbide Corp. in New York City. She married Dr. Irving Shapiro and they enjoyed 62 years together before his death in 2009. Their many interests included music, literature, camping, canoeing and folk dancing. They were also avid collectors of folk music, including 17 linear feet of vinyl discs, which Fran donated to the Folklife Center of Crandall Library in Glens Falls. Traveling the world and filming their experiences was also a large part of their lives. Fran and her husband were strong supporters of organizations that worked for the well-being of people and the environment, including ACLU, Amnesty International, Doctors Without Borders, Planned Parenthood, Sierra Club and others. They lived most of their retirement years on a farm in Riparius, New York, and then moved to Queensbury, New York. After Irv’s death in 2009, Fran moved to The Glen at Highland Meadows. Survivors include her daughter, Nora Barth of Windsor, Colorado; grandchildren, Kirsten Leymaster of Westervillle, Ohio, Joshua Osborne of Ellicott City, Maryland, and Stefan Osborne of Washington, D.C.; six great-grandchildren; her brother, Al Zolon of Kennett Square, Pennsylvania; niece, Jo Meer; and great-niece, Rachel Whitlow of New York City. Fran requested that her remains be donated to the Anatomical Gift Program of the Albany Medical College. There will be no calling hours or memorial service.